Testing the MOTHER 3 v1.2 Patch Live! For years Jeffman and I have worked on-and-off putting together the next version of the MOTHER 3 translation patch – mostly fixing existing bugs, glitches, typos, and such. Before releasing the new version 1.2 patch, though, we need to test it out all the way through to make sure stuff hasn’t broken… and I had an almost spur-of-the-moment idea to stream it live while testing it. So last night PoeTrader and I started doing just that! A lot of viewers showed up and it turned into a cool Q&A sort of format while I also gave inside info and even pointed out things lots of people don’t notice and/or miss in the game. We spent about four hours going through Chapter 1 – you can see the archive here. It’s full of info and trivia and stuff! We’ll be streaming it over the next week or so I assume, until we’ve finished the game without encountering any issues. There’s no set schedule or anything, it’ll probably be a few hours each night, though, so if you wanna join in and ask questions or chat with others, the streaming will be here. I’ll also announce it on my Twitter before we go live, so you can follow me there for updates too. I’ll be archiving all the streams for reference in some for or another, so if you miss a stream, no worries. Also, as I mentioned a few times in last night’s stream, we’ll be publicly releasing translation tools and files around the same time as the version 1.2 patch, so that people who speak other languages can translate MOTHER 3 into their own language. The tools won’t work with every language, but I’m sure clever fans can figure out workarounds of their own or build off of our work. We’ll also be releasing the assembly source code for the hacks, so that people who are curious about how the technical side of the project can scream in horror. And who knows, maybe it’ll allow intrepid programmer to help improve the programming even more down the road. So, super-quick summary: gonna be testing the upcoming patch live on Twitch here over the next week or so, follow me on Twitter here and/or here to find out when it’ll be happening each night! 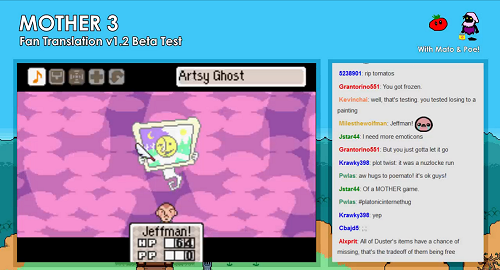 30 Comments to Testing the MOTHER 3 v1.2 Patch Live! We will be able to patch the patch to the old patch or will we need a clean rom? You’ll need a clean ROM – we’ll be sure to mention that in the readme and announcement, plus the patching program will tell you if you’re not using the right ROM. I watched for a few hours last night and will definitely keep an eye on the stream going forward. It’s so amazing to be able to watch people who worked on a game play their creations — that’s why Nintendo’s Treehouse presentation at E3 was such a joy and it’s why I’ll be coming back as long as you guys are doing this! So what exactly is being changed in this patch (in general)? I was going to play through Mother 3 again but wasn’t sure when, but once this patch goes live I will! This is incredibly cool! Thank you! Ah, so you ARE fixing Duster’s combo bug! This’ll make it worth playing a second time for me. Hard part will be finding the time for it! Animegame97: It’s mostly just bug/glitch/typo fixes, nothing too major if you’ve already played the game. We’ve just had these fixes piling up over the years so it’s finally time to get them out there. Funny there’s a new patch; I actually started a new playthrough a little while ago! Will my old save data work on the new patch? Yeah, it should – none of the save file system has been changed. Hello, I just registered on your site. I’ve been reading it for quite some time, and thought of this as the best ocation to say something. Just finished Mother 3 last night for the first time ever, with your patch, of course. You guys did an amazing work on it. I read about all the changes you had to apply to the game to get the patch to work right. Boy, must have been tough and frustrating. Yet you didn’t gave up at it. P.S: Sorry if the wording seems strange, English isnt’t my native language. Ohmigosh, this is AMAZING. 😀 I’ve been wanting to translate the game for a while now. Mato, a question: you can use the tools to make story hacks, too, I guess. Right? I suppose you could use the tools to change the text to make a whole new story, but you can’t really change the game itself with them. The tools/files are more meant for people to translate the game into other languages than to edit the existing text, but it should still be doable given enough patience and elbow grease. An E and two 8: Thanks for the kind words! I just want to thank you for all your hard work. I’ve been reading the translation notes on your Legends of Localization website (can’t wait to read about the rest of the game! I’m curious about that sign on the highway that talks about places you can get a hotdog… Haven’t played in awhile so I don’t remember exactly what it says but you know that one I mean! :P) and there’s obviously a LOT of work that goes into a project like this… I mean you can tell just from playing the game that the script is absolutely huge, and I know- Well, next to nothing about Japanese but I do know that it’s structured differently than English so just translating that alone would’ve taken forever, not to mention all the bug fixes and “behind-the-scenes” stuff that aren’t so apparent… It’s pretty amazing that people do this with the end goal of making their work as transparent as possible. 😛 I just wanted to say thank you! Mother 3 is my favorite game of all time and I am so grateful that I got the chance to play it in English, even if Nintendo never officially releases it. I don’t think I noticed any glitches or bugs, I’m sure there was a typo here or there but none that stand out immediately. I’ll be getting this when it’s done though! It’s funny, I just started playing through Mother 3 again last night, and had no idea you guys were even working on this. 😛 You are truly doing God’s work, sir! Hey this is great! I will be watching. I love MOTHER 3, good to see a new patch!! Also, I’ve changed my name from “Mother2fan” to the above. Mato: I felt something warm in my heart, hehe. 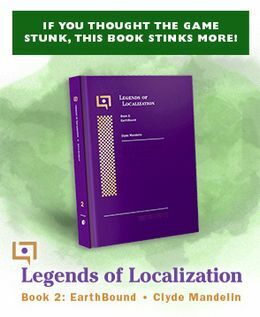 Now I saw Ronnie commenting about that… Will you add more translation notes to the Legends of Localization site, right? I was thinking of playing mother 3 again in the future and now with this new patch I cant wait. So when can I get my dirty little hands on this lovely piece of beauty? Not really sure yet, it mostly depends on how fast we can get through the game, how many issues pop up during then, and how long it takes to write the readme. I’ve been popping in and out of these streams–they’re great to leave on in the background! I remember jumping in during the Ch. 3 stream during the point where you were fighting the Cactus Wolf, and you started asking around about better, more punny names for it. Did you ever settle on one? Because I wanted to suggest “Peycoyote.” A combination of coyote and peyote! Eh? Eh? …OK, I’ll show myself out. I dunno if we’ll change its name, but so far nothing’s stood out enough to warrant it. Maybe inspiration will strike randomly in the shower or something though, that always seems to be the case. Hey, Mato: out of curiosity, were you ever planning on localizing the Oh-So-Snake (Osohebi)? Originally it was a play on Osohe Castle and the word for snake, but the fan translation script oesn’t really seem to emphasize that. Of course, you might bring its name up when you’re fighting the thing in your playthrough. I haven’t watched that far yet. But can I play it? Please please please. I plan to have it ready for download sometime next week if all goes well. Nice work there! Too bad about the sound issues during naming. That is annoying, not gonna lie, but completely understandable given the lack of source code and how you basically had to redo how text is displayed there from scratch. I do wonder though, maybe you could work around it if, when you “finish” the naming altogether, you “blank out” all the text boxes before the fading effect starts. Would that prevent the slowdown there? It’s been years so I don’t recall the details, but I do remember implementing some things to lessen the effects of the slowdown – it actually used to be much worse than it is in the final patch! I’m not sure what the cause is anymore, but my gut says having the text disappear wouldn’t necessarily fix it.